You can make an argument that Joe Namath broke quality sportswriting, and it'll only be when he and those who revered him finally retire and/or die that we'll have a chance for it to be fixed again. Namath was to Baby Boomer sportswriters what Brett Favre was to ESPN over the last decade-plus: The festering, undead, unstoppable example of all the excesses that corrupted something that was once great but became craven and dedicated only to feeding itself. Namath put all the sportwriting tropes into place: The cocky underdog, the athlete-as-mythic-figure, the big headline CONTROVERSY "let's all pretend that athletes care about what's in newspapers even though they totally don't" junk, the Real Men Rise to the Occasion career story lines, that blasted, incessant, moronic "guarantee." Namath had an above-average career and one famous game in which he didn't even attempt a pass in the fourth quarter. And, still, to this day, every time he starts yapping, his pronouncements are treated like thunderbolts from the gods. This has to end someday, right? 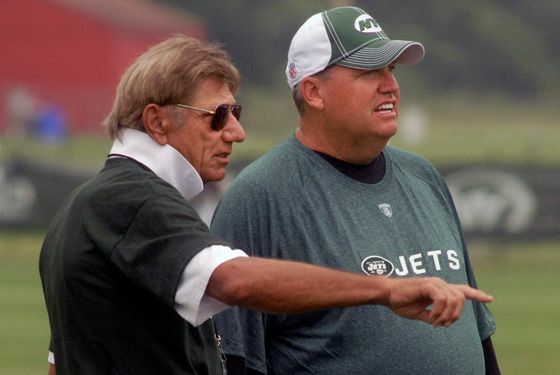 Anyway, Joe Namath, a 68-year-old man who hasn't been directly involved in professional football for almost 35 years, has decided that Rex Ryan is too nice to his players, or something. "It starts at the top. Coach Rex Ryan I think has been doing a great job getting the team to two (AFC) Championship Games," Namath told ESPN Radio. "But if there's one thing about the athlete, if you keep telling him how good he is, he's going to start believing it, to the point that he may not be preparing not quite the way he should. He may be losing some respect for the other team." What does that even mean? This is a typical Namath Baby Boomerism: It is not about game plans, or preparation, or personnel, or even just blind luck from time to time. It's about Respect and Teamwork and Today's Pampered Athlete. Does Namath even watch football? They don't even pretend coaches inspire teams to win with Big Speeches in movies anymore. Good freaking grief. To Ryan's credit, he actually responded to this nonsense. "I welcome him to come out here and watch our guys prepare," Ryan said. "He'd see a team that, in my opinion, prepares as well as any team I've been around. I disagree with him." Yeah, see, that would require Namath to actually step out from behind a microphone. If you tried to explain to Namath even the most basic trap play an NFL teams runs, his head would burst into flames right in front of you. Joe Namath has no idea what he's talking about. Why are we listening to this guy again? Because he — let's quote Tony Kornheiser here — "with his antiestablishment shaggy hair, mustache, white shoes and Life-Is-a-Bacchanal philosophy, became a symbol of inevitable, triumphant change." Oy. Here we were, thinking he was just trying to get laid. Freaking Baby Boomers, man. We wish Namath a long and healthy life, and we hope he makes lots of money at trade shows hawking merchandise for accomplishments that are literally more than 40 years old. But please, please, please stop talking. Or, more to the point: People, please stop pretending he has something to say. We're begging.